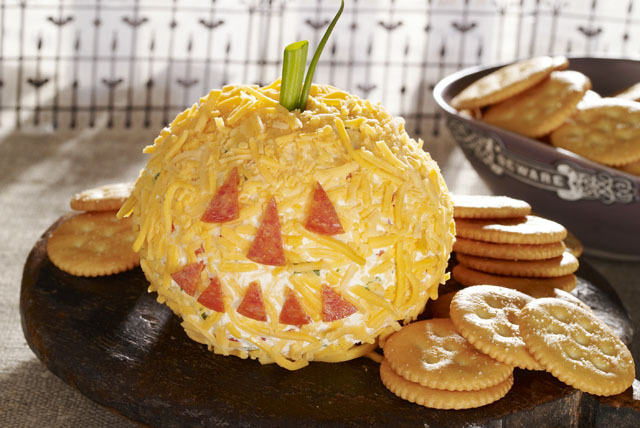 Discover your new favorite Halloween recipe when you make this Jack-o'-Lantern Cheese Ball. Dress up cream cheese in pepperoni, red peppers and cheddar for this delicious Jack-o'-Lantern Cheese Ball recipe. Cut 4-inch length from green end of 1 onion; slice remaining onions. Beat cream cheese and 1-1/4 cups cheddar with mixer until blended. Stir in sliced onions and peppers. Refrigerate 1 hour. Prepare using PHILADELPHIA Neufchatel Cheese and KRAFT 2% Milk Shredded Cheddar Cheese.